St. John of Capistrano, Priest - My Catholic Life! Today’s saint, like Saints Francis of Assisi, Maximilian Kolbe, Jerome Emiliani and many other male saints, was a prisoner of war. And like all the others, that experience changed him for forever. Being confined to four walls made him realize how precious was the life that God had given him and how sad it was to waste it on frivolities. Religious life was not an escape hatch for John of Capistrano, the last exit on an unsuccessful road. John had studied law before he was captured in battle and had even become the mayor of the major Italian city of Perugia. He was bright, energetic, and successful. Life was his oyster. But once he had an inner conversion, he would never look back. In a shocking display of humility, he mounted a donkey backwards and rode through the streets wearing on his body a list of his worst sins. People ridiculed him and pelted him with dirt and dung. In this forlorn state he presented himself at the door of a Franciscan monastery to seek admission. He was immediately accepted. After studies, he was ordained a priest in 1421. John’s humility and austerity never rested. He continually mortified himself, fasting, going barefoot and sleeping little throughout his life. He was a protégé of the great Saint Bernardino of Siena, a fellow Franciscan. Like Bernardino, John became a renowned preacher and traveled throughout central and northern Europe drawing vast crowds. John lived poverty so totally that he, along with other reforming Franciscans of his generation, made it appear as if they were the measure for Christ’s poverty, instead of Christ being the example and inspiration for Franciscan poverty. John’s reforming efforts were the beginning of the divisions that would eventually cleave the body Franciscan into three distinct Orders. Already famous in his mid-sixties as a theologian, preacher, and inquisitor, John was appointed by the Pope to lead a team of Franciscan missionaries to Hungary and the Bohemian peoples of central Europe. John Hus, a Bohemian priest, had been burned at the stake for heresy by the Church in 1415. This searing event had caused his followers, known as Hussites, to increasingly separate themselves from the Church. Hussite theology was a precursor to the Protestant movement that engulfed northern Europe one hundred years after Hus’ death. The Pope wanted John of Capistrano to either convert the Hussites or to subjugate them. John’s mission to Hungary and central Europe produced mixed results. He was an effective crusher of heretics, but his techniques did not always display the tact such a delicate mission required. 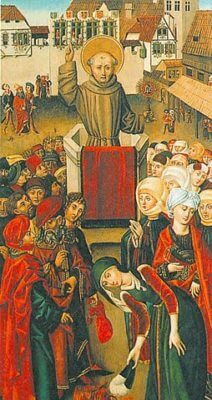 After the shocking fall of Constantinople to the Islamic Turks in 1453, John led a preaching crusade to unify a Christian response. At the age of seventy, he personally led troops in a successful battle to defend Belgrade from the Turks but died soon afterward. Over two centuries after his death, John and his melodic last name of Capistrano were immortalized by his Franciscan brothers when they named a large mission in southern California in his honor. The Mission of San Juan Capistrano, although ruined by earthquakes, is a much visited stop on the famous chain of missions that run up and down California like vertebrae. This soldier priest and tireless reformer and preacher was canonized in 1724. Saint John of Capistrano, we ask your intercession to embolden all preachers to present the truths of Catholicism in all their fullness and vigor, and to buttress that preaching by an impeccable life of virtue and apostolic activity.